Low wooden steps are placed under the aperture through which we can watch Christian Boltanski's Theatre d'ombres at Jupiter Artland. Children and toddlers clamber up and peer inside, delighted by the spectacle of dancing demons and ghouls projected into the darkness. Bring your gaze to the fore and you will find the source of the drama: a cast of crude forms bobbing limply as if from a baby's mobile. Boltanski seems to be laughing in the face of death, and children are invited to share the joke. When I meet the 71-year-old conceptual artist in the light of the courtyard, the place is mobbed. After walking a short way from the crowds, Boltanski surprises me by gesturing for us to sit on some muddy steps. He's France's most important living artist, but he's not afraid of getting scuffed trousers during his show's opening weekend. Neither does he seem phased by the prospect of a torrential downpour any minute. 'We are twins. Not the same age, but we are twins,' He laughs boyishly. Christian Boltanski was born on the 6th September 1944, the year Paris was freed from Nazi occupation. He seems tired but cheerful and is sipping a double espresso, the saucer for which is sitting on the ground by his crossed legs. 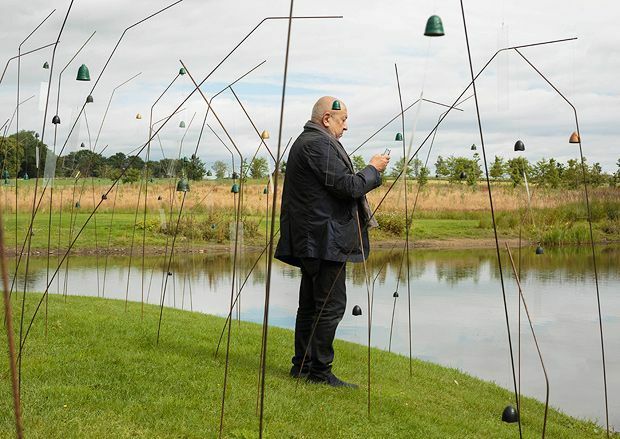 For Jupiter Artland, Boltanski has created a map of the stars as they were on his birthday with flexible metal 'stems' bearing Japanese wind-bells carefully plotted on an island within the park's duck pond. For an artist preoccupied with notions of chance and identity, it seems both apt and silly to tell him that I too was born on the 6th September. Using his birthday as a parameter for an artwork might seem self-indulgent, but Boltanski is known for using red herrings. 'Everybody is so important, so unique, and yet at the same time so fragile,' He explains, 'everyone will be forgotten, will die and there is nothing we can do about this. The only thing to do is to remember.' It seems Boltanksi's Animitas is a monument to anybody who has lived or will live. One man may have conceived it, but if no man is an island then the bell tolls for everyone. There is something otherworldly about the shrill chatter of hundreds of small bells that can be heard long before catching sight of Animitas through the thickets. It's Boltanski's first permanent artwork in the UK and its arrival is causing a great deal of excitement. But how does he feel about the idea of permanence? As he has so often said, it is not the objects that are most important in his work, but the ideas. Permanence is not something given much credence by Boltanski, perhaps because he dwells on the bigger picture of death and legacy. After all, permanent sculpture is only as permanent as the place it resides: adverse weather or conflict can quickly change the rules. Les Archives du Coeur is an artwork strongest in the imagination of its audience – indeed, when I submit my heartbeat, which felt a little like going along to donate blood, the experience is clinical and a little underwhelming. I chat to the gallery assistant who hands me something like a stethoscope. We discuss the weather and how personable Boltanski is. After 30 seconds it's done: nothing to observe, no epiphany. Shortly after leaving for the courtyard though I am acutely aware of my heartbeat, and the heartbeats of those around me. I watch as people sip coffees, discuss artwork, and hold their children. For how long will we hold on to memories from today? For how long will the artists exhibited at Jupiter Artland be remembered? Some will fade into obscurity before others, but all will vanish. I wonder briefly if Les Archives du Coeur will be around long enough for someone to make the pilgrimage to Teshima to hear my heartbeat after I'm gone. Jupiter Artland, Bonnington Edinburgh. Theatre d'ombres and Les Archives du Coeur will be exhibited until 25 Sep, £8.50 (£6).